The workers, who are members of the CWA Graduate Student Employee Union (GSEU) and Local 1104, are paid an average of about $20,000 per year, while also being required to pay fees to the university. With the university recently announcing a $180 fee hike, grad workers will be required to pay over $2,000 back to the university - about 10% of what they make. 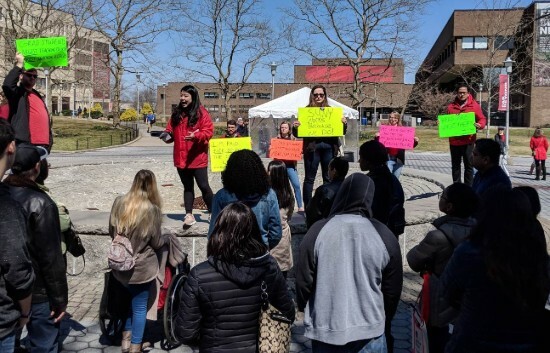 The grad workers responded rapidly to the fee hike announcement, gathering this past Saturday to picket on Admitted Students Day at SUNY-Stony Brook. “Since the fees were announced very recently, we wanted to act very quickly," said Gregory Lella, a teaching assistant in history. "And we also wanted to make newly admitted students aware of the conditions of labor that some of their instructors are under." In addition to on-the-ground protests, GSEU members have been making trips to Albany to advocate for legislation that would exempt all SUNY graduate workers, teaching assistants, and research assistants from paying fees. READ MORE about the GSEU picket here.